WASHINGTON & BERLIN, Germany - April 23, 2018 - PRLog -- Twenty-five German integration practitioners and public officials will travel to the United States, from April 28 to May 9, to learn firsthand how American cities welcome and integrate immigrants and refugees as part of the Welcoming Communities Transatlantic Exchange (WCTE). The third edition of the WCTE will again bring together teams of professionals and leaders from nine communities—four from the United States and five from Germany—to expand their networks as well as share innovative approaches to integration initiatives at the local community level. Each community is represented by a team of individuals comprised of local government representatives, refugee resettlement agencies, civil society and interfaith organizations. The German experts will meet their U.S. counterparts during a five-city, 11-day trip. The U.S. delegation will reciprocate with a November trip to Germany. Beyond the communities selected by WCTE, exchange participants will also travel to the capital cities of both countries to discuss immigrant and refugee issues from a policy perspective. The first part of the exchange will take place in Washington, D.C.—where the delegation will meet with government officials as well as local nonprofit organizations. The participants will then split into three cohorts spread across Boston, Charlotte, and Montgomery County, Maryland. The visits are designed to provide insight into the welcoming infrastructures in place within each respective community, highlighting both innovative approaches to reception and the unique challenges. They will explore issues such as housing; school and workforce integration; accommodation of vulnerable populations; and opportunities for collaboration between the private and public sector. Over its first two years, this unique, two-way exchange program has spurred innovation and provided inspiration to both American and German communities alike. "As a result of this experience, I am thinking bigger and bolder about transformative integration and the imperative to engage receiving communities in the process," said Stephanie Teatro, Co-Executive Director of the Tennessee Immigrant & Refugee Rights Coalition and part of a four-member team representing Nashville during the 2017 program. "We picked up very concrete new ideas from the German communities we visited to support integration and build more welcoming communities. For example, the 'welcome points' in Düsseldorf that created one-stop shops for immigrant communities to access resources, and the 'welcome boxes' from Leipzig that offered new Leipzigers guides to the city, both to critical services and cultural activities." "The exchange program was an eye opener for me with regard to similarities and differences between German and American integration policies," said 2017 German participant Türkan Karakurt, who serves as the speaker of the Social Democratic Faction for Migration & Culture, Freiburg City Council. "Inspired from the city of Los Angeles, we started a citizenship campaign. The Utah Compact inspired us to start a process that will hopefully lead us to a 'Freiburg Compact.'" Toward the end of the 11-day trip, the group will convene again in Anchorage to share their findings and further discuss the issues before parting until the Germany-based portion of the exchange takes place in November. 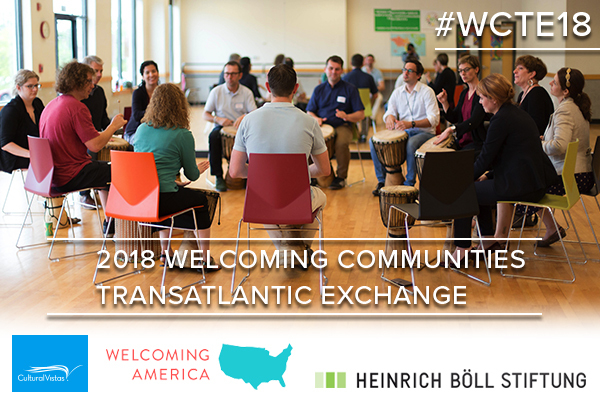 The Welcoming Communities Transatlantic Exchange is organized and administered by Cultural Vistas, together with its partners Welcoming America and the Heinrich Böll Stiftung North America. The program is funded by the Transatlantic Program of the Government of the Federal Republic of Germany through funds of the European Recovery Program (ERP) of the Federal Ministry of Economics and Energy (BMWi), as well as by the U.S. Department of State, the Robert Bosch Stiftung, the Heinrich Böll Foundation, and BMW Group.